Advice on How To Wear Black? Home Lifestyle Advice on How To Wear Black? I love wearing black and as a size 16, I always thought I had to in order to look slimmer. However, when I saw Dawn French’s new look, I noticed she could wear black stylishly, without having to cover up. Do you have any tips for wearing black and are there any items out there that’ll show off my figure rather than hide it? Every woman loves black, including me! It is not only elegant but an essential basic colour for your wardrobe (50% of the best wardrobes are made up of neutral colours). If you are wearing it for the wrong reasons however (to cover up), it will never make you smile! Black is slimming simply because darker colours absorb light & hence don’t catch the eye, leaving a streamlined shape. However, it can be a very draining colour against lots of skin tones. Here are our top three tips & recommendations! Look under your eyes & ask yourself – is it causing dark circles? If so, opt for a charcoal grey or navy, which can be softer. 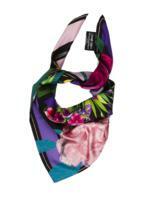 Team your black dress with a bright neck scarf, colourful costume jewellery or even a brighter lipstick. This can make black a good colour for everyone! I like Accessorize, which is always a haven of colour. You want to make sure you are not merely ‘covering up’ with good structured fabrics that give shape & support. A big misconception is that looser fabrics flatter the body. Marks & Spencer’s for choice. 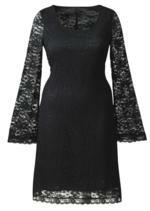 Arnott’s also have some fab little black dresses. This piece first featured in Woman’s Way. Julie Cobbe is Founder of Ireland’s first Fashion School for women (Stylefish.ie) that combines the realness of classes & consultations with the convenience of an online members club. She set up Stylefish.ie in March 2009 to combine her love of teaching with her love of fashion. Style Fish shows women how to become their own stylist & do it for themselves through their personalized body shape & colour styling class or consultation.